Haute Route San Francisco riders were welcomed to the inaugural event with a private kick-off reception in Ghirardelli Square on Thursday evening, featuring a wide variety of savory tapas freshly made by the Haute Route’s Official Chef and Culinary Ambassador, Matthew Accarrino, along with two renowned local chefs, Charles Phan and Joseph Manzare. Accarrino, the Michelin-starred chef of SPQR in San Francisco and an avid cyclist, was dedicating his life to becoming a professional cyclist when a severe leg injury in his teens ended his dream of cycling professionally. Over the course of his year-plus recovery, he began cooking and has been ever since. With hard work and determination, he’s been able to combine his two passions of cycling and cooking to great success. This year, he is lending his culinary expertise in fueling the body for maximum performance and cooking up amazing food for Haute Route riders at select U.S. events. Following the Haute Route San Francisco Stage 2 finish atop Hawk Hill, riders descended into the Presidio area beneath the Golden Gate Bridge and enjoyed recovery bowls and handmade pizzas by the nationally acclaimed chef. Under the direction of Accarrino, SPQR has been recognized with a Michelin star in the 2013 through 2018 guides. 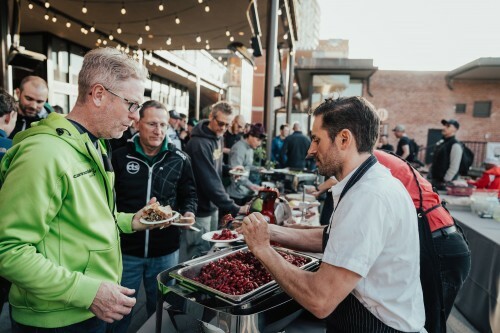 He is the official chef for Tour of Utah, has cooked for cycling events such as Levi’s Gran Fondo, CTS Fig Fondo and also works as team chef for HincapieRacing’s pro continental team, Holowesko|Citadel p/b Arapahoe Resources. Named Food & Wine’s “Best New Chef” in 2014 and nominated multiple times by the prestigious James Beard Foundation, Accarrino is also the author of SPQR: Modern Italian Food and Wine.